Innovative Retina Treatment. Individualized Care. Discover the different aspects of diagnosing, treating and managing retinal conditions. Educate yourself on our detailed surgical options for genetic and/or advanced retinal conditions, such as vitrectomy and pneumatic retinopexy. We are a leading pediatric and adult ocular oncology practice in the country led by our board-certified vitreal surgeon, Dr. Amy C. Schefler. Our house advanced technologies detect retinal problems through exams, imaging, optical coherence tomography, and more. RCH has invested in focal lasers, PRP lasers, and intravitreal injections (like anti-VEGF injections) to assist in the management of your illness. The retina can signal a distinctive measure of your overall health and nutrition, as most human diseases manifest as a retinal symptom or issue. A Team of Experts. Experience You Can Trust. Meet Southeast Texas' Largest Retina Team. Retina Consultants of Houston houses one of the most amazing gatherings of doctors in one practice. All of our physicians are board certified by the American Board of Ophthalmology and specialize exclusively in diseases and surgery of the retina, vitreous, and macula. We invest in our patients and their vision by providing state-of-the-art diagnostic equipment, cutting-edge surgical and nonsurgical techniques, and a team of doctors who were all educated at the top five medical schools in the country. We will put your health needs first. You can rest assured that you are choosing the retinal care you deserve with doctors who strive to provide you with compassionate, comprehensive treatment. RCH invites you to learn more about the conditions we treat, how we decide on what treatment is appropriate, and why you want to choose our practice to manage your care longer term (if necessary). Please call for a consultation appointment at any of our Greater Houston, TX area locations. We look forward to meeting you and learning how we can help save your sight and improve your quality of life. Nationally Recognized Retina Care Right in Your Community – 14 Locations Throughout Greater Houston. While preserving the vision of our patients at RCH, we stand by our commitment to you, your family, and the referring doctor to provide world-class retinal diagnostics and treatment. How do we do this? We offer 14 accessible office locations throughout southeast Texas that are staffed with some of the best doctors within the ophthalmology community today. Our staff is uniquely trained and highly skilled to provide exceptional service to each patient. Retina Consultants of Houston consists of team members with specialized training and multiple certifications with years of experience in treating patients with the highest level of retinal care. We also have a collaboration with the Greater Houston Retina Research Center in studying new medications and producing impactful case studies in the pursuit of sight-saving techniques and pharmacology involving the retina. Our research focuses on blinding diseases such as age-related macular degeneration, retinal vein occlusions, and diabetic retinopathy, as well as uveitis, vitreomacular adhesions, macular holes, ocular tumors, radiation retinopathy, and retinal detachments. Mine was, more or less, an urgent situation, so I was very lucky to be able to see her. She had a staff who did the photos/preliminary exams and they were excellent. When I saw her, she had all the results. The news was good and she gave me all the info I needed. To me, time spent was not relevant, as she gave me all the time I needed to ask questions. Since the news was good, I had very few questions. Dr. Major and all the staff are amazing! Very caring, very comfortable atmosphere! Highly Recommend! The entire staff has been very patient and caring. I'm thrilled to have Dr. Shah as my doctor! He's so gentle and caring. Dr Shefler and everyone else in the office were outstanding. I highly recommend Retina Consultants of Houston. I was told by my Optimologist that there was a concern with my retina and encouraged me not to delay in seeing a Dr at Retina Consultants. Fortunately, Retina Consultants allowed me to come right away to have my eyes examined. Dr. Kim and the staff was very professional and courteous. I felt that I was in the best place for my eye issues. I highly recommended Retina Consultants. Respected Retina Care You Can Trust. Serving Greater Houston Since 1985. For more than three decades, Retina Consultants of Houston has served patients throughout the Greater Houston area. 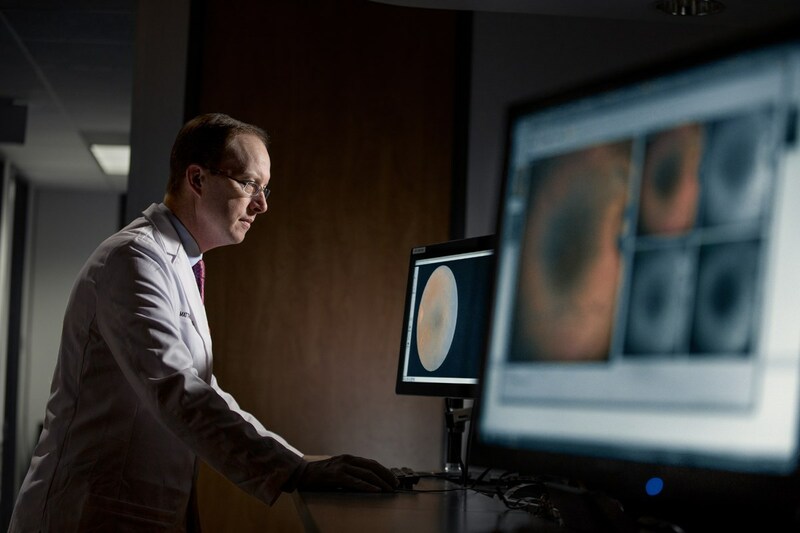 Now with 12 physicians and 14 offices, we have grown to become the largest retina-only ophthalmology practice in Southeast Texas and thanks to the groundbreaking research we conduct right here in Houston, one of the most respected in the country. Despite this growth, our mission remains to provide the highest level of personalized care and service to each of our patients and referring physicians.